Fifth-grader Clara Lazen has achieved two major results by rearranging the atoms used in nitroglycerin: a unique new molecule, and making the rest of us feel rather dumb in the process. There are many ways to discover new molecules and their properties, but I doubt many are more delightful or endearing than a ten-year-old fumbling some balls and sticks together before innocently asking her science teacher, "is this real?" ... and being right. 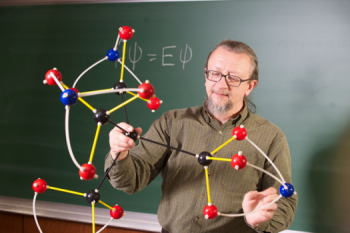 And that's exactly what happened in Kenneth Boehr's fifth-grade science classroom when 10-year-old Clara Lazen approached his desk with a fully constructed tetranitratoxycarbon molecule. The physical model young Clara had constructed was a somewhat complex combination of nitrogen, oxygen, and carbon that Mr. Boehr had never seen before. To his credit, instead of dismissing the creation as mere child's play, he photographed it and sent it to a chemist at Humboldt State University for rigid analysis. His instincts were correct, and soon after, tetranitratoxycarbon was officially recognized as a feasible molecule. Tetranitratoxycarbon doesn't exist in nature, but based on its unique arrangement of atoms, can be created artificially in a lab. These things take time and funding, however, so an "on-paper analysis" is coming up first. For those interested in a little light reading, you'll soon find a copy of Professor Robert Zoellner's (pictured above) paper on the subject (with a co-author credit given to Clara ... Awwww!) in Computational and Theoretical Chemistry. According to Zoellner, this new molecule has all sorts of possible uses, spanning the gamut from bottling energy to blowing crap up. I can see why a 10-year-old might be subconsciously be drawn to it. This is all great news for Clara, as she and the rest of her class have shown an increased interest in chemistry and the rest of the sciences since the discovery. And as for the science teacher, Mr. Boehr? We don't know for sure, but I would be willing to bet that the next six months of his life will involve little more than fifth-graders storming his desk with nonsensical molecule configurations hoping that they've stumbled onto something. Poor guy.